Snap&Read is available where and when you need it. The tool that helps you read diverse content across the web. The data below is collected when Snap&Read Universal’s tool is used. Data is transmitted securely through Secure Socket Layer (SSL) and is encrypted while at rest on our servers. See particular user for other data that may be collected and how it can be used. Translated Text We use Google Translate’s service to translate text. When a user chooses text to be translated, it is done so anonymously. Text is passed through our proxy server and on to Google Translate for translation. Yes - if a user elects to use the translation service. 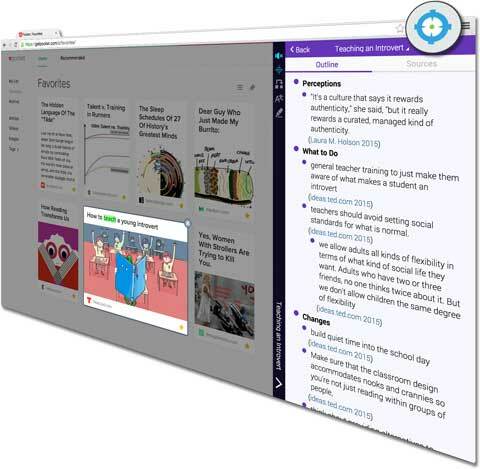 Text spoken with Online text to speech (Chromebook and translated text on Windows only) On Chromebooks and translated text on Windows, the user may choose to use an Online text to speech voice to speak text out loud and highlight text as it is spoken. When a user chooses text to be spoken aloud, it is done so anonymously. The chosen text is passed through our proxy server and on to IBM’s text to speech service for processing. No - a user may choose a voice installed on their device. When using locally installed text to speech, no spoken text is sent to servers. Text saved in Sources Allows sources to save and sync across all devices. Yes - if a user elects to use the Sources tool, data will be collected. A Student Account can only be set up through an Educator Account. Snap&Read Universal does not require use of personally identifiable student information. Personally identifiable data for student accounts is solely used for educational purposes by the student and the student’s educational institution. The only data collected is that which is valuable for educational purposes. Readability of text students are exposed to on websites (Flesch-Kincaid Reading Ease, Flesch-Kincaid Grade Level, Gunning-Fog Score, Coleman-Liau Index, SMOG Index, Automated Readability Index). Reported to educators of student for educational purposes only. No text is ever collected from websites (only the numerical grade level or numerical reading ease of the text is reported). No - Administrators can turn on “Privacy Mode” which deletes all of these records and restricts future collection. Approximate Number of words read. Reported to educators of students for usage data. No - Administrators can turn on “Privacy Mode” which deletes all quantities of words read and restricts future collection. Approximate Time spent Reading Reported to educators of students for usage data. No - Administrators can turn on “Privacy Mode” which deletes all time spent reading and restricts future collection. Number of Words read using Text to Speech For future plans to report this data to educators for instructional purposes. No - Administrators can turn on “Privacy Mode” which deletes all number of words read using Text to Speech and restricts future collection. A Child Account can only be set up through a Parent account. Personally identifiable information is not collected on a Child Account. Upon request from a Parent, all Child Account data will be deleted as quickly as possible - not to exceed 30 days. We do not monitor or view any Personally Identifiable information or content stored in Snap&Read Universal.Below lists the limited circumstances where your information may be accessed by our employees. Where necessary to protect the rights, property or personal safety of Don Johnston Incorporated and Snap&Read Universal’s users (including protection against potential spam, malware or other security concerns). Aggregate, non-identifiable information is solely used to enhance Snap&Read Universal and, in the case of anOrganizational Account, support implementation. We do not, under any circumstances, advertise to Student Users or Child Users. For Educator Users, Parent Users, and Personal Users, we practice permission marketing: you will only receive information from us when you give explicit consent in advance to receive the marketing information. Data is stored on servers located in the United States. If you live outside of the United States and have laws governing data collection and use that differ from U.S. law, then you acknowledge and agree that you are transferring your Personal Information outside of those regions to the United States and that, by providing your Personal Information to Snap&Read Universal, you consent to that transfer. Some data is also stored locally on your computing device and synchronizes to our servers when an online connection is present. Data that syncs include Option Settings, Text saved in Outlines, Text saved in Sources; and if a user is a Student User: Readability of Text, approximate number of words read, number of words read using text to speech, and approximate time spent reading. Are you sure you want to navigate away from Snap&Read Universal's page?